Call of Mini: Double Shot is an iPhone app that attempts to capitalize on the popularity of the best-selling iOS app Call of Duty World At War: Zombies. Even though Call of Mini: Double Shot isn’t the most original program out there, it still manages to be very fun, thanks to the wide variety of weapons and addictive upgrade system featured in the program. The program focuses around a group of people who are fight for survival in the aftermath of a zombie apocalypse. The program is broken up into two phases: a day phase and a night phase. 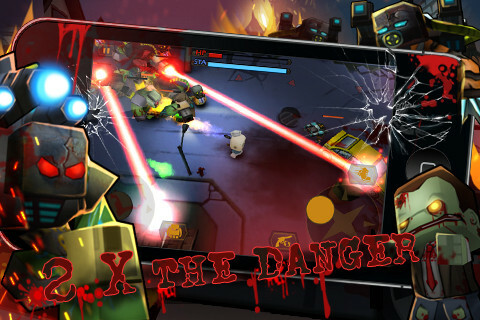 During the day phase, players must blast their way through waves of zombies and collect cash that is hidden around the level. 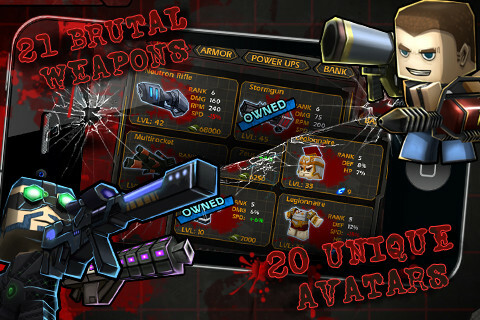 At night, players are able to visit shops to purchase upgrades and new weapons to use in the next day’s fight. One of the program’s biggest failings is that it only features two maps. Even though each map is interesting and visually appealing, there simply isn’t enough variety available to players. Because the rest of the program is so good, it’s a real shame that the game ‘s developer Triniti Interactive Limited didn’t put more effort into creating more maps. Another notable flaw in the program is the decision to not feature any sort of multi-player mode. These types of shooters are always enjoyed best with friends, and the inability to do so with Call of Mini is a real letdown. The two maps are certainly large enough to accommodate more than one player, so it’s really a mystery as to why the program’s developer decided to cut this feature. One of the application ‘s strong suits is the availability of 13 separate weapons for the player to use. Each of these weapons has a distinct feel to it and really adds depth to the app. Additionally, all of these weapons can be upgraded multiple times, ensuring that they can be customized to fit a player’s style of play. As if these weren’t already enough customization options, players can choose from eight distinct characters that have their own unique abilities. Players can have up to three weapons equipped at any given time, meaning they’ll have to choose the weapons that are best suited for the task at hand. Even though there are already tons of other zombie shooting games available for the iPad and iPod touch , Call of Mini is a great deal at only $0.99. While the app certainly has some flaws, the most prevalent complaint is that the game is too short. There are far worse complaints to make about an app than the fact that it leaves players wanting more. AppSafari review of Call of Mini: Double Shot was written by Darius Reimm on November 11th, 2011 and categorized under Action, App Store, Arcade, Fun, Games, Scrolling Shooter. Page viewed 4617 times, 3 so far today. Need help on using these apps? Please read the Help Page.